9.30 a.m., Morning Prayer, Castletown Church, Kilcornan, Co Limerick. Readings: Isaiah 50: 4-9a; Psalm 118: 1-2, 19-29; Philippians 2: 5-11; Mark 11: 1-11. Do you remember being packed into the back of the car as children, and all the fights that went on in the back of the car? Getting upset because someone else was pushing over into your space? Getting stuck in the middle and not being able to see anything? Two weeks ago, around Saint Patrick’s Weekend, a friend sent me a cartoon showing Saint Patrick, dressed up in his mitre and green robes, sitting at the wheel of a car, with the back seat full of snakes. What are your favourite journeys in life? I can close my eyes and as a child see myself on the road out from Cappoquin to my grandmother’s house. I know every hedge and ditch, every bend on the road, and I can name who lives in each and every house along the way. Or in my mind’s eye I can travel along the banks of the Slaney from below Bunclody down to Wexford, and out into Wexford Harbour at Ferrycarrig. Now, as an adult, I never fail to be enthralled by the bus journey along the north coast of Crete, from Iraklion to Rethymnon, especially in the evening, when rays of light are sparkling and glistening on the deep blue sea and the sun is setting behind the old Venetian Fortezza. Psychologically, for many of us, when we call to mind sweet memories of journeys like these, they represent the way in which we think of life as a journey. They don’t all start in the same way, there are bumps and bounces and pitstops along the way, but the journeys we travel on and the journey of life are worth it all in themselves. And, along the way, we try to make that journey as good an experience as possible. We have been with Christ on a journey to Jerusalem throughout these weeks in Lent. This morning, on Palm Sunday, we have arrived with him in Jerusalem. Along the way, there have been many eventful happenings. During these Sundays in Lent, we have followed Christ from his Baptism in the Jordan out into wilderness, and then back to Galilee, where he begins to proclaim the Kingdom (Mark 1: 9-15, Lent I). We heard how the disciples became confused about what sort of Messiah he was going to be, and how he told them to take up their crosses and follow him (Mark 8: 31-38, Lent II). We saw him clear the traders and the money changers from the Temple, where they were a barrier to the free access of people to worship God, all people, regardless of their background, race, religion, language or social status (John 2: 13-22, Lent III). We then joined Nicodemus as he came to visit Jesus in the night, under cover of darkness, and heard him foretell how he was going to be lifted up on the cross as a sign of God’s promise of eternal life, and declare how ‘God so loved the world that he gave his only Son’ (John 3: 14-21, Lent IV). And then, last Sunday, we heard how some people, because they were Gentiles, Greek-speakers, still felt they were excluded from access to Jesus, and so excluded from access to the love of God (John 12: 20-33, Lent V). The journey from Galilee to Jerusalem has been a journey from darkness towards light, but a journey that has not been an easy one for the Disciples. Along the way, though, they have seen what temptation is like. They have been challenged too to take up their cross and to follow Jesus. They have seen the tables being turned when access to God is blocked by those who seek to make money through the exploitation of the poor. It has been a journey from darkness into light. A journey that challenges us to accept the love of God and to be open to the love of others. At times, the Disciples must have felt like children squeezed into the back seat of the family car as others decided to join in on the journey, crowding into their space along the way, as with the Greek-speaking Gentiles who had to go to Philip and Andrew to get to see Jesus. But the journey is important. And, while they are challenged by their illusions along the way, they get there. In his poem http://www.patrickcomerford.com/2012/01/christmas-poems-18-ithaka-by-cp-cavafy.html, the Greek poet Constantine Cavafy writes about Odysseus returning from the Trojan Wars to his home on the island of Ithaka. Yes, along the way, the Disciples have had to shed some of their illusions … about others, about themselves, about what Christ is calling them to. Now they have arrived in Jerusalem, with all those experiences behind them, they find that the people in the city still share all the illusions they think they have shed. The people still think that if Jesus is the Messiah, then he arrives in Jerusalem as the conquering hero. Hosanna in the highest heaven!’ (Mark 11: 9-10). But this welcome, this understanding of what the mission of Jesus is about, was never the purpose of the journey. 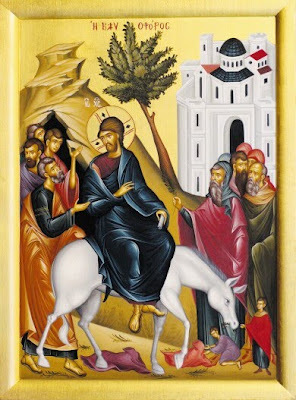 Christ choses the way he enters Jerusalem on Palm Sunday. But he abandons all choice about how he is going to be taken outside the city to die a few days later. And Christ, who receives a lively welcome into the city on Palm Sunday, is taken outside the city and crucified on Good Friday. ● Christ upsets our priorities. ● Christ makes demands on our time. ● Christ makes demands on our commitments. ● Christ challenges us about where we are going. ● And yet, Christ offers no quick fixes. Christ steps into the comfort zones of the people in the city, and offers no quick fixes for the masses. They change their attitude, and there is a rapid, radical change in the social climate in Jerusalem that first Holy Week. As we move through Holy Week this week, the journey continues towards the meal in the upper room, the betrayal in the garden, the arrest and trial, and along the road on Good Friday to Calvary. It continues to the Cross, and the to the tomb. And still we are not there yet. We are not there. We are not there until we arrive with the women at the empty tomb next Sunday morning, on Easter Day. Continue with me on this journey through Holy Week. Join me at the foot of the cross on Good Friday, some time between 12 noon and 3 on Friday afternoon. And join with me in the joy and the love poured out at Easter. Now in union with Christ Jesus you who were once far off have been brought near through the shedding of Christ's blood; for he is our peace (Ephesians 2: 17). and in obedience died on the cross for our salvation.